You’ve built a strong Instagram following by putting in the hours, doing the research, and, ultimately, establishing yourself as an influencer in your niche. The next step? It’s time to finally get paid for all those hours you put in by monetizing your account with product endorsements. If the term “product endorsement” makes you cringe, know that monetizing your Instagram account doesn’t have to be sleazy. You can make good money by sharing the products you genuinely love with the people you influence. And, by endorsing great products, you’ll actually grow your authority and followers. More and more brands are looking to influencer marketing as an effective, authentic way to reach customers. In 2016, brands that utilized the technique spent $25,000 to $50,000 per influencer program. Since 94% of brands found these programs effective, they will spend twice that in 2017. There is, however, a right and a wrong way to go about monetization. If you’re making aesthetic compromises or alienating your followers with annoying endorsements, you’re doing it wrong. Luckily, there is a graceful way to make money selling any product on Instagram. Unless you’re Kylie Jenner, posting a photo of a random product on your Instagram isn’t going to make you money. To drive sales, push something that’s useful and relevant to the people that follow you. If you suggest a product that your followers end up loving, it will both make you money and build your credibility. By posting great, consistent content, you probably already know your niche. By interacting with your followers in the comments section of your posts, you also probably know the basic demographics of your audience. Brands love influencer marketing because it is highly targeted for a specific niche or demographic. People, too, would rather see targeted than random advertising. Unless you’re looking for casualties, find your target before you shoot off any arrows. On Instagram, sell products that are either directly related to your niche or are in the sphere of interest of a typical follower. Don’t push Tinder, for example, if your audience is typically married, female, and Christian. Your followers also enjoy and, probably, identify with your personal brand aesthetic. Your aesthetic is an important part of your niche and an indicator of your demographic. 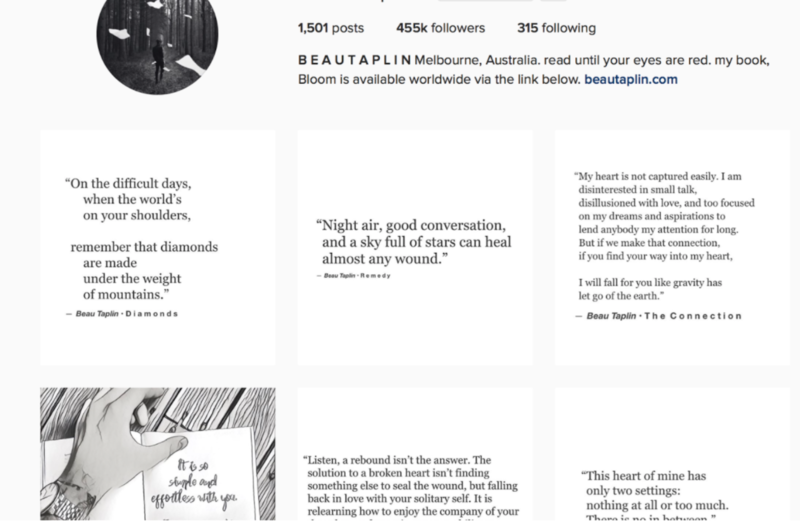 Successful influencers, like Beau Taplin (@beautaplin), have a strong brand aesthetic. Don’t abandon your aesthetic, at any point, to sell something. Doing so will do damage to your personal brand that will end up costing more than the temporary influx of cash you’ll get from a misguided endorsement. With product placements, adapt the product to your personal brand, don’t adapt your personal brand to the product. Keep the color scheme, font type, and feeling of other posts when you make an endorsement. If you’re Beau Taplin, then, go after the black and white products. Only endorse those products you actually like. 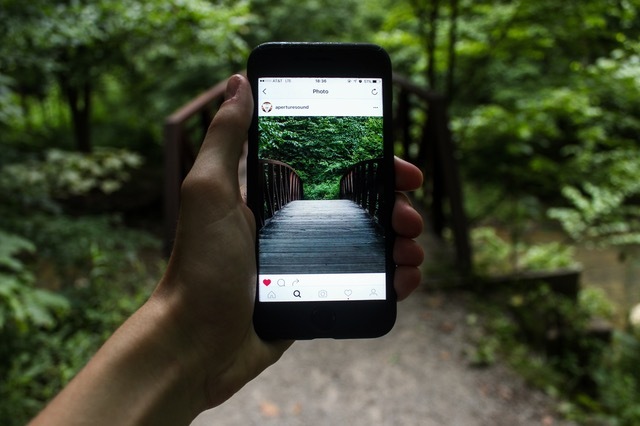 You don’t have to surrender your authenticity to make money on Instagram. Actually authenticity is a plus. Brands sometimes prefer influencer marketing over celebrity endorsements because, unlike actors, brand ambassadors can be real. Don’t think about a product endorsement as a way to make money, think about it as a way to add value. With a great product recommendation, you add value to your followers’ lives. By associating yourself with a successful product, you add value to your brand. And by referring customers, you add value to the product. Ideally, you’ll only promote those products that you’ve used and can genuinely recommend. Your followers were drawn to your account because, likely, you have similar values, lifestyles, and problems. If a product added value to your life, then, chances are, it will add value to your followers’ lives. 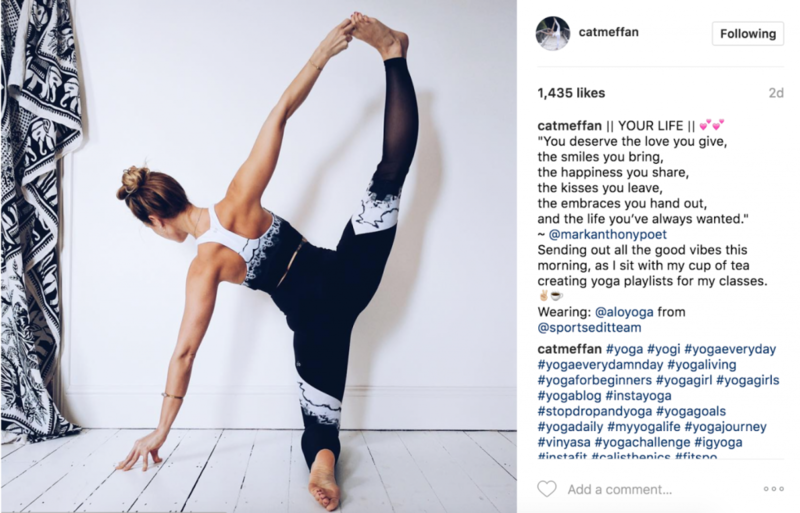 The yoga teacher Cat Meffan (@catmeffan) wears all the activewear that she endorses in her posts. She is, then uniquely positioned to make authentic recommendations to her followers. Brands that she wears, like L*Space, often return the value by featuring her posts on their websites. Product placement doesn’t have to be subtle, but it has to make sense. Skip those so-subtle-they’re-painfully-obvious shots of the product and, instead, make every product that you promote a crucial part of your story. Turn your endorsements into an opportunity to get creative with your content and tell exciting stories. The Food in the Air (@foodintheair) post below is only powerful because of how the product interacts, aesthetically, with the rest of the shot. Products make for powerful content too sometimes! Instagram captions are painfully underrated. Instagram is, primarily, a visual platform, but the majority of content discovery on the platform happens through text. Powerful captions use keywords, hashtags, tags, and engaging text to reach people. When you endorse a product, the brand may ask you to use a promotional hashtag. Alternatively, you’ll need to use the caption to direct followers to your bio link in a convincing way. The bio link, itself, should be a short, relevant web address that directs people to the product’s landing page. If you can write well in a way that incorporates useful features like hashtags and emojis, you can push any product in an effective way. Nowadays, people are pretty good at picking up on the fact that you’re trying to sell them something. Trying to be sneaky about product endorsements, then, probably isn’t going to work. Oh, and, if you don’t disclose sponsored content to your followers, that’s illegal. Stay on your followers’ (and the FTC’s) good side by owning all of your sponsorships. Be upfront about the products you endorse and spend a minute explaining why you endorse them. Your followers will appreciate your honesty. 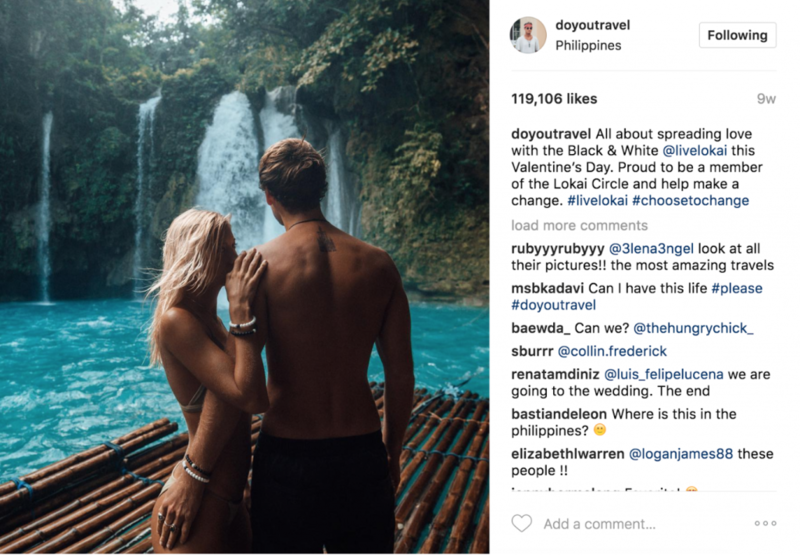 Traveller Jack Morris (@doyoutravel) famously makes six figures promoting products and destinations around the world on Instagram. Below, he takes a pretty obvious bit of product placement for the charitable vendor Lokai and owns it in the caption. Who can harp on him for “selling out” after an explanation like that? While Jack’s product placements aren’t typically subtle, he’s upfront with his followers about how he makes his money. Owning up to an endorsement, as he does here, changes the conversation. Perhaps you opened your social media accounts because you knew you should but you didn’t really know why or what it was going to do for your business. 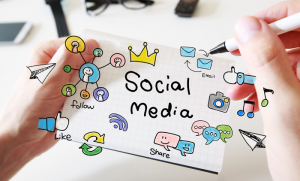 A few years back, most business-related social media accounts were just a place for happy brick and mortar customers to reminisce on their experiences or current customers to learn about (and hopefully bite on) new promos, products and services. At that time, it was hard to place a dollar value on each social media follower since their financial impact on a business was negligible, at best. These followers gave (and still give) businesses and fellow customers a non-financial value; more of a warm and fuzzy feeling than additions to the bottom line. As they do with technology, things have quickly changed…but only if your following has too. Don’t completely disregard the non-monetary value your original followers (we’ll call the ‘messenger’ followers) provide since they are the current-day village gossip. Remember the old adage that a happy customer will tell one person and a dissatisfied patron will complain to 10 friends. Luckily, social media and ‘likes’ have changed that dynamic a bit and happy customers tend to spread the word to a wider net. In addition to these ‘messenger’ followers, you should also aim to grow your ‘purchaser’ following. These followers are quieter and appear to be less active on the surface but they are actually more active when it comes to the bottom line. To push your social media platforms to the next level, increase followers and gain the ideal mix of followers. Engage: If you neglect your social media, it will quickly reflect in your number of followers. Lack of posting means disengaging with the messenger-style followers (which are necessary to keep up and expand your overall following) and purchaser followers will get upset if their questions go unanswered. Post Often: Again, think nurture not neglect. Water the plant and it will grow. The highest social media earners post a lot…as in multiple times per day. This might sound like a lot but so long as you're providing worthwhile contributions that keep people engaged, and not over-saturating them, you'll be fine. Pre-Plan: If constant posting is overwhelming or will take precious time away from you actually working in and on your business, you can pre-plan posts ahead of time rather than keeping your social media accounts open all day. Hit Every Angle: Text-only posts should still have a place on your pages but attention spans are only getting shorter as the years go by. To reach every possible follower, appeal to the visual and auditory crowds. Videos or audio clips are a great way to reach the non-readers out there but keep it short and sweet. Hire Out: If it’s financially feasible for your business, hire a social media planner who specializes in growing and maintaining your pages with specific goals in mind. Many planners work with several businesses so you don’t have to commit to a full-time employee if you usually work solo or your company is on the smaller side. Stay Authentic: If you choose to pre-plan posts or hire help, it’s easy for your social media accounts to look like a robot is behind the scenes. If everyone knows your business is in Seattle, don’t schedule posts at 1am Pacific. If you’re staying engaged and you make sure to throw timely content in on a regular basis, you’ll stay authentic. 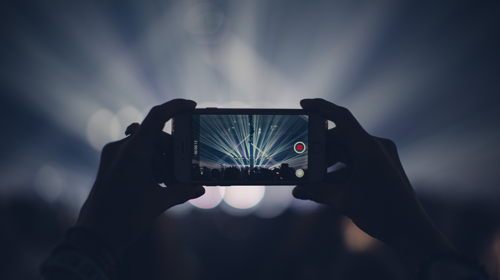 Utilize Stats: Avoid shooting in the dark and make use of a service like our Influencer Links that allows you to track the performance of each of your posts. Find out what works so you can post more efficiently to maximize profits. Influencer.co allows you to create easy tracking links and generate professional reports for free. Become an Affiliate: Even if your end goal is to sell your own product, start with an affiliate program to increase attention and to start earning income. This will also get followers used to purchasing something familiar from you before they make the plunge into the unfamiliar. 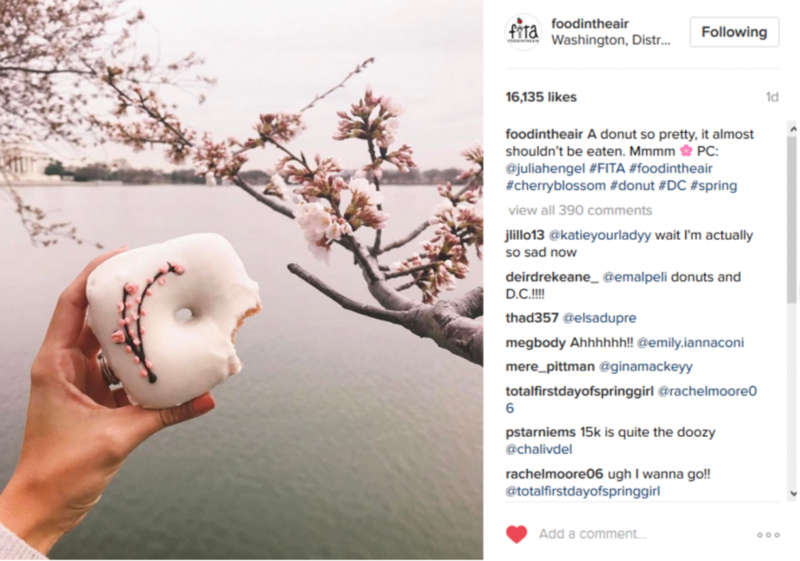 Paid Endorsements aren’t just for Celebrities: Reach out to brands you use and like (again, think authentic) for social media promotion gigs. 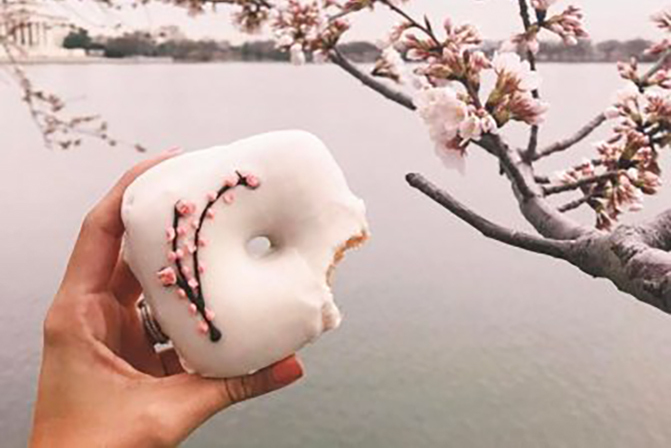 Companies will pay for a simple photo of their product or a shot of you at their location if they have brick and mortar stores, along with a designated hashtag, of course. Filter, filter, filter: You don’t need expensive filming or photography gear but photos should look the part if you’re expecting likes let alone a payout. Remove clutter from the scene and crop out anything distracting or unsightly to make for a clean, modern and professional-looking picture. There are several ways to increase followers and income on social media but the one thing you shouldn’t do is pay for followers. Sure, your numbers instantly look great after you purchase a bundle of followers but your real social media-savvy followers or companies you hope to work with will see right through the façade. They’ll label you, you guessed it, inauthentic and not worthy of their investment. This can impact all of your possible angles of online income so keep it real and stay the course to boost your follower ‘worth’ online. Ready to get serious about monetizing your following by promoting and tracking the products you care about? Influencer.co helps new, emerging and pro influencers, their managers, agencies and brands do just that, and make it dead simple.